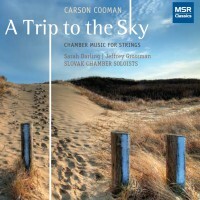 Quartet for Piano and Strings (A Sea Liturgy) (2009) was jointly commissioned for the Moscow Studio for New Music and the Arcturus Chamber Ensemble (Sarah Darling, artistic director). It is dedicated to the Arcturus Chamber Ensemble on its 10th anniversary. The work is cast in a single movement and is conceived as a “sea liturgy.” It attempts to conjure up an imagined set of spiritual rituals (not connected to any specific religion)—a ceremony of transformation and renewal performed in the context of a sea landscape. The opening Processional begins with focused, austere intensity: the instruments unfold from a single pitch (E) into a more rich harmonic landscape. A Ritornello of pulsating string harmonics leads into Invocation, a warmly lyrical discourse. The Offering is a faster, jubilant development of the Invocation, where the prayerful melodies of the Invocation are transformed into a gift for the sea. A return of the Ritornello leads to the Baptism. In this section, heterophonic melodies unfold out of the new substrate pitch (D). In the transforming crucible of the water, these lines becomes more and more extended harmonically. The Rebirth is a dancing development of the Baptism; the harmonic extensions are pushed from dissonance into chords of pure joy. Emerging out of the afterglow of the Rebirth is the Recessional, in which the music of the Processional is revisited, now transformed by the ritual to center on the pitch D. The Recessional fades away peacefully, yet fervently.